NYC May 2014- Day One: Get There, Get Settled, Get Going « How Do You Measure 525600 Minutes? Leaving Cash was especially hard this trip and I stressed out a lot over it. He’s in good hands but he’s old and lonely and barely leaves our side. We got up at 2 AM to finish last minute packing and head to the airport for our 5:55 AM flight. In typical, O’Hare fashion, they only had one checkpoint open and the line was ridiculously long– and not moving. Luckily, they opened another checkpoint and we rushed down to it, making it to our gate with about five minutes to spare. Michael and I sat across the aisle from one another on one of the bumpiest flights I’ve ever flown. It was like riding through Chicago’s pothole-filled streets towards the end of winter. The guy next to me, though wearing headphones, treated a good section of the plane to his Beyonce playlist for most of the flight. I didn’t feel comfortable saying anything but was really surprised the flight crew didn’t tell him to turn it down. Morning traffic was a little heavy at 9 AM and our impatient taxi driver rode the tail of every vehicle we followed, slamming on the brakes multiple times to avoid a collision. There were more than a few close calls as the driver refused to let anyone merge in front of us. Somehow, we managed to arrive at our destination safely. Our Living Rm/Kitchen at AKA. 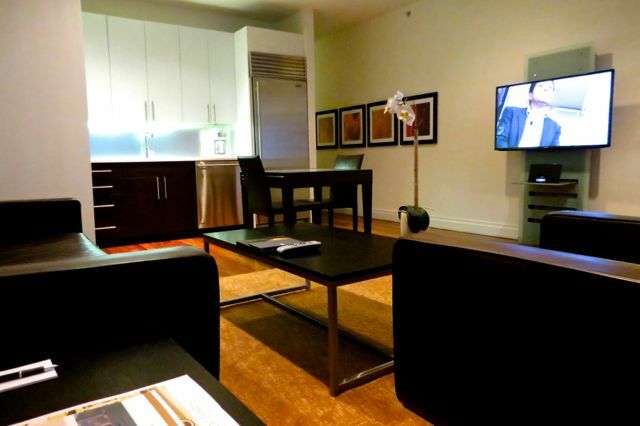 Home Away From Home AKA Times Square, is primarily an extended stay, apartment & condominium building and was a perfect choice for us. 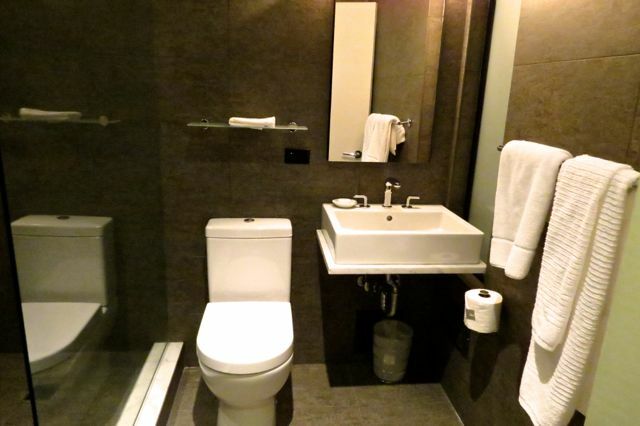 It was in the same price range as some of the regular hotel rooms we were looking at and it is actually larger than the average NY apartment. 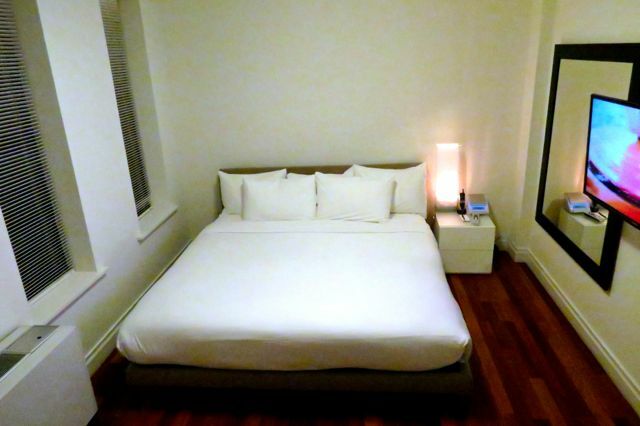 We have a full kitchen, washer and dryer and all the other amenities you’d hope for. I’ll let the pictures speak for themselves. Suffice it to say, we absolutely love it. In addition, there is a penthouse lounge, terrace and business center open for our use, with free Wifi throughout the building. Believe it or not, most places still charge a daily rate for WiFi. Having it on premises, means I won’t be spending nearly as much time at Starbucks, using theirs, as I have in recent trips. Our room wasn’t ready when we arrived, as we’d expected, so we checked our luggage and grabbed breakfast at Cafe Un Deux Trois next door. I’m sure I’ll probably mention it again later– we’re also staying next door to Hedwig and the Angry Inch, starring Neil Patrick Harris. Some of the people watching opportunities have already been interesting as this show draws a much more diverse crowd. We spent the remainder of the time before our room was ready, shopping for some supplies and relaxing in the penthouse lounge and terrace. 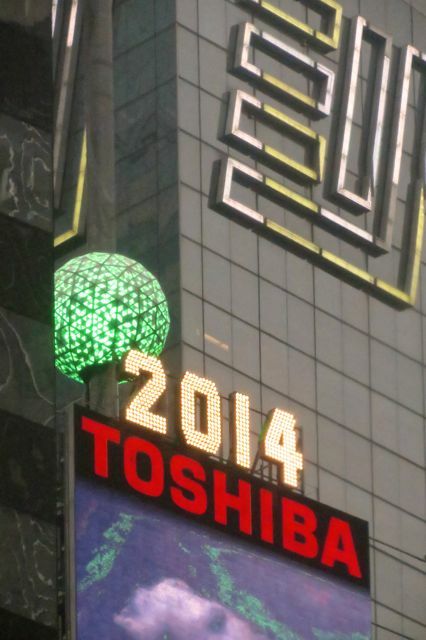 When we got to our room, we unpacked and check out our view which includes a clear shot of the crystal New Years’ Eve ball, high above Times Square. We took a short nap and then we were off to our first show. A Gentleman’s Guide to Love & Murder– You know the saying: Save the best for last? Well, we may have made a huge mistake and may have seen the best, first. Not that it’s an entirely bad thing– I mean, what a way to start a show binge! No matter what I write here, I won’t be able to fully capture my true feelings and appreciation for this show. 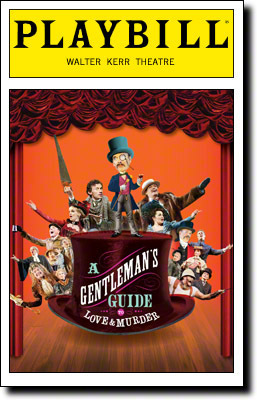 The best I can do is to say that once in awhile, a show comes a long when everything about it is just right… and everything about this production of A Gentleman’s Guide to Love & Murder is seamlessly delightful. The solid book and score by Robert L. Freedman and Steven Lutvak captures the music hall style but they didn’t allow themselves to get trapped by the genre and produced a thoroughly engaging, funny and rich work. The music here is essential to the plot and there are some simply gorgeous moments. Most shows I’ve seen have at least one moment, song or scene where I find myself wanting them to hurry up and move on. Not here. I was completely drawn in from start to finish. Director and Choreographer, Darko Tresnjak and Peggy Hickey have done a superb job staging this wild romp with moments of inspired genius. Their work together is a seamless blend as is their guidance of the tremendous cast. When a production is this good, it’s impossible to tell where one person’s work begins and another’s ends. Jefferson Mays and Bryce Pinkham are equally brilliant in their roles. They are both Tony-nominated this year but what gives Mays the edge over Pinkham is that he plays eight roles, sometimes leaving the stage as one and re-entering as another in just seconds. The featured women: blonde vixen, Lisa O’Hare; the lovely, Lauren Worsham; and I can’t leave out, the adorably funny, Jane Carr– are all perfectly cast. All the technical aspects are perfect for this production but I have to single out Linda Cho’s costume design. Her costumes are not just appropriate and highly functional, they are flawless. Her use of color and especially the exquisite textures in her period designs should place her as a top contender for a Tony Award this year. We had terrific front row, left orchestra seats last night… thankfully, we were not front row center. both Mays and Pinkham are spitters. Needless to say, the audience in the front center seats were showered with more than a good view of the stage. I would definitely see Gentleman’s Guide again… and I’ve added it to my list of shows I’d love to do in the future. It’s just bloody good fun! New Years Eve Ball from our window at AKA. Another Rainy Day in New York City We’ve often experienced rain in NYC but it was a literal downpour last night– to the point of streets and sidewalks flooding. We left the theater, sans umbrellas but in water resistant jackets, made it a few blocks and stopped under cover to see if it was going to let up. In doing so, we ran into Mare Winningham, currently starring in Casa Valentina, also avoiding the rain. There is always a bright side to every situation if you look for it! The rain let up a bit and we picked up pizza on the way back to our place and turned in around midnight. Tired, full and happy. By jlinamen1229 in Lifestyle, New York City, theatre, travel, Uncategorized on May 17, 2014 .